View More In Microscopes & Equipment. As your ears are itchy or swelling, you need to check what's going on in your ears, then you might visit doctors to have a close exam, but with VTOSEN USB Ear Endoscope camera, you will capture and view your inner ear situation clearly. Hence, say goodbye to your unknown ear inflammation, save much time & checking fee in visting doctors. Preinstall the corresponding app for Android devices, windows 7/8/10 computer, Mac OS cimputer, then plug the camera into your device before opening the app. NOTE: For Android user, pls download "CameraFi" from Google Play Store or scaning the QR code on the manual to download the app directly; For Windows User, pls download the software from www.inskam.com/download/camera.zip; For Mac OS User, pls use "PhotoBooth" or "QuckTime Player" on your Macbook. What do Ear Cleaning Endoscope bring? -It will clearly present the health status or situation of your ears, as well as your sweetie pets, on your smartphone, tablet or computer, hence, say goodbye to unknown ear problems. -It will save much time and lots of money in visiting doctors to fix your ear issues. -It will help you to remove the ear wax or ear mite more completely and safely. At VTOSEN, we offers 100% guaranteed satisfaction for our customer, free customer service and 45 days free warranty available at your disposition. 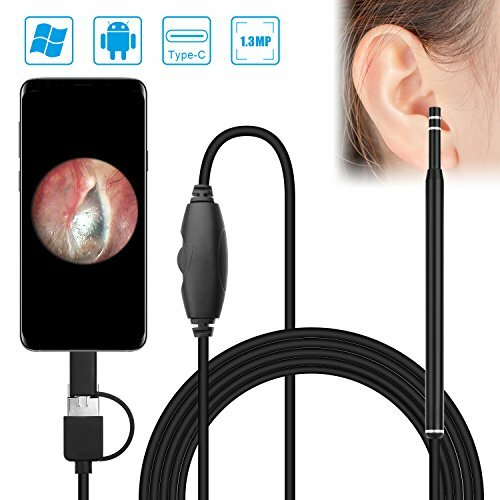 【3 In 1 Convertible USB Design, Working with Android Devices, Windows & MAC OS】: With the 3 in 1 usb design, this otoscope is compatible Android 4.2+ device, Windows 7/8/10 computer and Mac OS computer, which enables you to see the situation in your ear and clearly display on your smartphone phone, tablet or computer. NOTE: Your android device needs to support OTG & UVC function, and this camera isn't compatible with iPhone IOS user. 【Easy to Setup, Plug & Play to View Your Ear Health Status】: This tiny otosocpe is a magical scope camera tool for ear inspection, which makes it possible to know the health status of your ears by capturing and viewing undistorted image or video at a close range. Then, your ear wax or ear mite can be cleaned more completely and safely under this guidance, saving much time & lots of checking fees in visiting doctor. 【No Heating Chip Technology for A Safer Check】: Compared with other similar product, this usb ear endoscope camera is featured with no heating chip, which means the camera head will never get too hot while operation. Hence, the ears will be refrained the possibility from the scald. 【Sharper Sensor & 6 LED Light Tech, Providing Clearer Image 】: The 5.5mm/0.21inch diameter otoscope camera head is featured with a sharpeer camera sensor up to 1.3MP and 6 adjustable led lights, providing a clearer image and more outstanding color reproduction no matter how dark the ear is. 【Abundant Accessories Tool, More Multifunctional & Pratical Camera】: Except the main camera unit, the packages contains a abundant accessories tool, including 4 x ear picks, 4 x sticks, 4 x cotton swab sticks, 2 x annulaire earpicks, 1 x cleaning cloth for checking and cleaning the earwax, ear canal, eardrum, not only a great helper for your ears, but also a great tool for your dogs, cats as well. If you have any questions about this product by VTOSEN, contact us by completing and submitting the form below. If you are looking for a specif part number, please include it with your message.